Zero House employs prefabrication and a range of structural, insulation, and interior cladding materials to address affordability and sustainability. 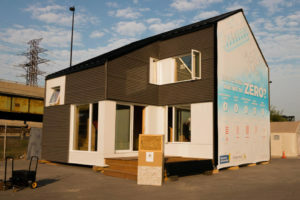 Zero House is an innovative green building designed and built by a group of students and faculty from Ryerson University, Toronto, and the Endeavour Centre, a school teaching sustainable design and construction in Peterborough, Ont. net-zero cost differential to comparable housing. Using black flexible membrane “peel and stick” building-integrated photovoltaics (BIPV), the townhouse-style 102 m2 (1100 sf) home discretely provides energy for itself. The BIPV integrates into a prefinished aluminum standing seam roof and exterior wall panels. A rendering of the Zero House. The project addresses sustainable housing by creating an “infill” homes design that can integrate into existing urban neighbourhoods as walk-up apartments over commercial on existing east-west arterial streets. These “through-unit,” two-storey stacked townhouses are designed to optimize daylighting and natural ventilation by providing three solar orientations with their indented south-facing terraces. The design can vary to suit a variety of tenants and sites. 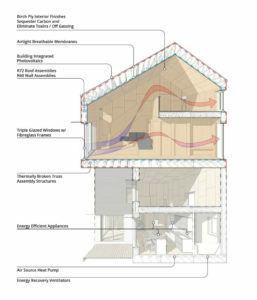 Passive House construction principles, breathable air barriers, and triple-glazed, fiberglass-framed windows allow for an energy efficient and healthy building envelope. The home sequesters 25 t (27.5 ton) of CO2 from the atmosphere, while a similar conventional home would emit 45 t (50 ton). The building is insulated to withstand Canadian winters using a combination of straw bale and blown-in cellulose insulation for walls and roof and wood fibre exterior insulation. By removing carbon, greenhouse gas (GHG) emissions are reduced. The unit’s interior is clad with maple veneer plywood panels and the solid ash flooring is salvaged from the ash beetle infestation damaging Southern Ontario forests. 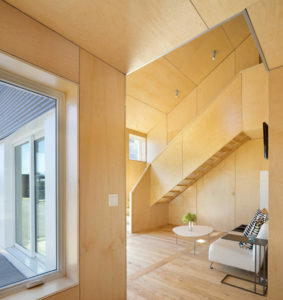 The home’s interior is clad with maple veneer plywood panels and the flooring is solid ash. Since it uses modular, prefabricated components, the whole house can be assembled onsite in days. The entire construction of a prototype was done by students of the Endeavour Centre offsite in a temporary tent “factory” over three months using only four solar panels to power all power tools and equipment. EcoStudio (an interdisciplinary team of faculty and students from Ryerson University, Endeavour Centre, and Seneca College) is constructing a permanent Zero House in Collingwood, Ont. A prototype of Zero House was exhibited at EDITdx—a design and technology expo in Toronto—for 10 days last October, and was erected in just seven days. The custom prefabricated structural insulated panels were craned into place in a single day, and clad over the rest of the week. At the end of construction, only 8 kg (18 lb) of unrecyclable waste was produced. The architectural design for Zero House was led by Cheryl Atkinson Architect, a Ryerson faculty member with the university’s architectural science students. The prefabrication research, design, and construction was led by Chris Magwood of the Endeavour Centre. While EcoStudio is responsible for the design and previous builds of the house, Endeavour Centre alone is handling the construction for the permanent installation in Collingwood.